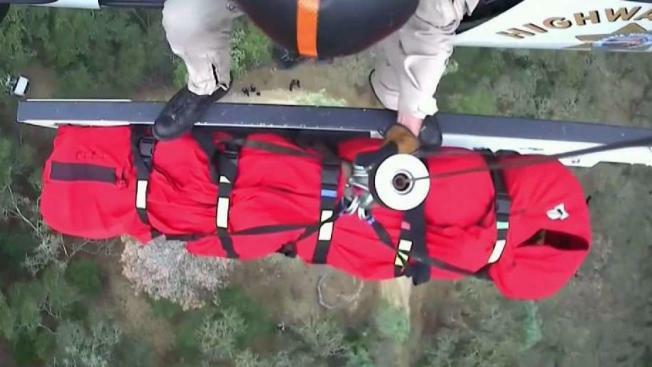 A woman who fell off a horse on a trail northeast of Green Valley Road in the Alamo area of unincorporated Contra Costa County was saved Wednesday in a dramatic air rescue around noon, according to the California Highway Patrol. The woman, who is in her 50s, is expected to survive mild to moderate injuries she suffered in the fall, according to Flight Officer Paramedic Shaun Bouyea. Fire district officials got a call about the accident at 12:04 p.m. and requested an air rescue. As the helicopter hovered at 75 feet, a paramedic was lowered to the woman. He secured her in a rescue apparatus, and the two were lifted up to the helicopter, according to Bouyea. The woman was flown to a landing zone roughly a mile away, fire officials said.